On Friday 7/7 I attempted to make a deposit at the Arden Hills Wells Fargo branch. I was depositing my wife's signed paycheck into our joint account using a deposit slip from our checkbook and requesting no money back. The teller and her supervisor (Suzanne?) refused to accept this because I was on a bicycle in the drive-through lane. I left. On Monday 7/10 I successfully made the deposit in the exact same branch from my bicycle. After posting this experience on my blog I got a lot of comments, some indicating no problem with doing this and others saying their Wells Fargo branch does not allow it. I would like to know the policy; is it company-wide, branch by branch or teller-dependent? I routinely ride my bicycle to work and have done this exact transaction before (see 6/2/06) without issue. Please let me know what to expect. Wells Fargo responded to the Messages and Alerts section of the account screen. I apologize that you experienced a problem when you attempted to make your deposit. With proper identification, there should be no problem in making the deposit as you described however, the decision is ultimately with the branch. I have forwarded the details of your experience to our management. We constantly strive to provide you with the highest level of customer service. We appreciate your business and thank you for banking with Wells Fargo. Hmmm, so the decision is ultimately with the branch. I guess I'll have to go and inquire at the Arden Hills branch about what their policy is in relation to serving cyclists in the drive-throughs. I also wonder about Joyce's "with proper identification" qualification; in my email to Wells Fargo I was very specific about the nature of the transaction and it's one for which I have never had to provide ID since I'm not getting any money back. I even referred in my email to the last time I did this transaction from my bicycle so that if they were looking at the account they would see the same deposit amount from the prior month. The deposit would recur in the months previous but I can't be certain I did them from my bike on those dates. It was a pretty quiet weekend, cycling-wise, too bloody hot to do much. I rode over to the Riverview Theater Saturday morning to watch the OLN Tour de France coverage. I'd not done this before, and it was great fun. It's free, for one thing, and you can buy a bagel and orange juice and coffee and watch the coverage on the Big Screen in air-conditioned comfort. I chose my days well. Saturday there was a breakaway by five riders that got 28 minutes out in front of the peloton, described as cruising along as on a Sunday ride, though at a pace that would kill me. One guy got dropped from the breakaway group after trying an aggressive breakaway of his own, then just 5km from the end the remaining four split into two pairs, the front one consisting of Jens Voight and Oscar Pereiro. Voight won in a final sprint, the other pair rolled in 0:40 later, the fifth guy, dropped some time back, came across 6:24 after the winner and, if the rules were strictly enforced, those five would have been the only riders left in the Tour. It was 29:57 before the main peloton came across the finish line and that would have left 152 riders outside the stage's time limit and therefore out of the Tour. The race jury moved the limit from 9% to 10% and the peloton could remain in. Whew! Though CBS on their Sunday Tour de France weekly wrapup didn't make much of this day, to me a nearly half-hour pickup by these two riders (giving Pereiro the yellow jersey) seemed like a hell of a gain for one day. Sunday I suggested that Henry, Karla and I go to the Riverview, watch the coverage for a while, have a bagel, and Karla could go off and play the 9:00 service then come back and get us. We did this, driving over in the surprising but very welcome rain. It was another great day to watch, a six-man breakaway getting 5:40 up on the main peloton. The peloton began reeling these guys back in until there was a crash. You must have seen the coverage of this, it even made the local news station sports report on Sunday night, six guys go into a corner, front two slip, one of them falls, number five brakes and falls over, slides into metal barrier, number six brakes, locks up back wheel, in control behind falling number five, but crashes into barrier and flips over in extremely dramatic fashion disappearing behind the guardrail, the bike tumbling down, then, in a final touch, a water bottle flying up from the bike. The remaining three racers carried on. Rider One (Rik Verbrugghe) suffered a complex fracture of his left femur and is out for the year, Rider Five (David Cañada) broke his right clavicle and Rider Six (Matthias Kessler), whose dramatic tumble over the guardrail will long be remembered, actually got back on his bike and carried on. He tarried until the peloton caught up with him and ended up finished 12 minutes down. Those of us who find helmets useful admired the rocks stuck in the air vents of his helmet as he carried on. With just three riders, the time gap narrowed, ticking down to under two minutes and then under a minute. The race got really spread out, and the peloton was pretty small but ruthlessly tracking down the remaining riders. On a final climb before the downhill into the finish line the breakaway dwindled to two riders and the lead to 0:25. Down the final descent and you almost could hear the Jaws theme as the main group closed the distance. It was oddly compelling, shots of the two lead riders coming around a corner and then, startlingly close, the main group. A rider broke away from the main group and began pushing hard, closing the gap to the breakaway riders rapidly but then the Finish Line went by and they'd held on, Pierrick Fedrigo winning the stage, Salvatore Commesso right behind, Christian Vande Velde at 0:03 seconds back, his attempt to catch the breakaway guys at the finish having fallen just short, and then the pursuit group of 33 riders 0:07 back. Other racers continued to drift in for quite a while including Kessler in a group of 12 riders 12:04 back. OLN doesn't broadcast them all coming over the line, of course, but it's interesting to see the official results, with a group of four riders coming in at 22:08 behind the first place finisher and one final straggler in at 32:05. It was still raining when Karla returned and we went home. The CBS Weekly show got moved from it's 4:00 time frame last week to noon this week, and we watched that show as well. The bit about the last two days seemed not to convey the drama, but maybe every day's like that and it's just that I saw those two days of OLN coverage (we don't have cable at home). I did putter with the bikes a bit in the afternoon, installing a U-lock holder on the red Schwinn and buying some odd bits of hardware to try and permanently mount my taillights to my rear racks. I highly recommend the Riverview's Tour de France coverage. The French scenery is lovely and well-shot as the helicopters, cars and motorcycles cover the ride. The commercials are doubly-annoying on the big screen, unless they're doubly amusing; the Flomax ad for male urinary difficulties in particular seemed a crowd favorite. I'm not sure why the Riverview does this, the crowds don't look big enough that they'd make a lot of money on bagel sales, but I'm glad they're doing it and hope to continue attending. See you there! I rode over to join some of the Three Speed Tour guys for a beer or three last night. It's only about 3 miles from work, and it wasn't particulary hot out, so I didn't change and just rode over in my work clothes, wool slacks and black dress shoes. 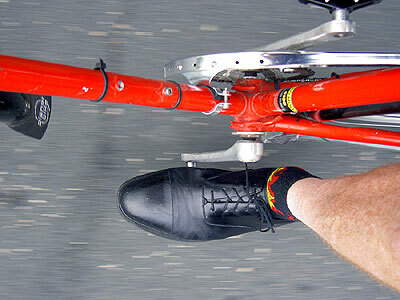 Shoes being bulky, I just left my cycling shoes at the office, figuring, I'll just get 'em when I ride in tomorrow. What I didn't consider is how completely dorky this would look this morning. I got ready to leave and realized, well, I guess I'll wear these dress shoes in. I'd hate to wear white socks, my usual, with them, so instead put on my pair of freebie black cycling ankle socks that say "Burn It Up" on them and have little flames around the anklet. Thankfully, the Burn It Up is concealed by your shoes; my socks ought to say, "Hey Guys, Wait Up!". On go the cap-toe Dresssports, the shoes I normally leave in my drawer at work. With the electric blue Ralph Lauren shorts ($4 on clearance at the end of last season, Marshall Fields having failed to cajole anyone into paying $48 for a garment so hideous) and yellow t-shirt, I looked like a total doofus. My wife had a chuckle as I left for work, calling out "Have a good day, PeeWee" and I'm not sure but I think even the cat averted her eyes. Fortunately the children were still asleep and didn't have to witness this spectacle. Here's the look. Worth a thousand words, eh? This is on the red Schwinn which is mostly done evolving. Besides the nice shoes, flaming socks and pasty while ankles, you can see the Wald chain guard I put on, replacing the stock nuts and bolts with 4mm stainless allen bolts, the zip ties holding the Nexus eight-speed shift cable, the stowed Esge/Pletscher two-legged kickstand under the left chainstay and the water bottle eyelets, one of which I successfully cross-threaded last week. I bought a 5mm tap to fix this, haven't yet done it, but I'll soon have a bottle cage back on there, and the Blackburn accessory mount, so I can carry the Mammoth pump and also sometimes an old Nightstick battery which I have plans for using as a power source for launching model rockets off the rear rack, sort of a human-powered mobile Scud launcher. My son is 14 and wants to launch rockets, a bicycle would be perfect, you can go right to the spot in the middle of big grassy areas, deploy the two-legged kickstand, thus maintaining a level platform, and launch away. I actually used to do this as a youth myself and amazingly still have the two-piece launch rod that is bike-portable. That project, once done, will be for another post. Fortunately, I don't think I saw anyone I know on the way to work and went directly to the bathroom to change. Here I discovered that I'd forgotten to pack dress socks, so emerged in shirt, tie, wool slacks, black cap-toe Dressports (now looking very appropriate) and little flaming socks. Fortunately, I have some regular black socks in my shoe drawer and discreetly changed over to them once I got to my office. Some other items of interest. Here is how I carry my stuff on my commute. Rather than panniers, I use the roomy Timbuk2 Medium Cargo Tote to carry my clothing, raingear, office things (PDA, keyboard, cell phone, camera, etc), little tool kit etc. To carry this, I toss it in a Topeak Rear Basket that attaches and detaches very quickly from the rear rack by way of a thing Topeak calls a Fixer 6. I leave the basket on, but if you want it will slide right off and that handle extends and the little wheels allow you to wheel it around behind you, something I've never done, something which when combined with the socks/shoes/shorts combo could lead to unbearable levels of doofiness. 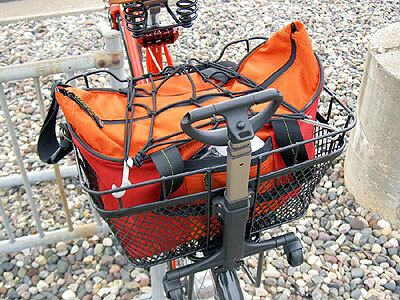 I use a bungee net to hold down the Cargo Tote and lock. Nothing ever bounces out, the Cargo Tote is very comfortable to carry over my shoulder, and I can pack the clothes loosely enough that they don't wrinkly. People are sometimes surprised to find out that I, wearing pressed dress shirt, tie, wool dress slacks and the (almost) always-appropriate black Dressports, rode my bike in. I figure it quietly helps break down a couple of the regular objections to bike commuting, the "I have to dress up at work" one and "the I can't stink" one. The basket works well for other stuff, too. I've carried beer back there, an Igloo cooler, groceries. The Topeak system is pretty slick but brings up a gripe of mine; the non-interchangeability of bike luggage. For instance, in our fleet of bikes we have a German front basket (on Karla's bike), a Jandd front bag (on Geneva's), the Nashbar Toto basket (not in service at the moment) and an Ortlieb front bag (on my bikes), all of which require their own specific mounting hardware on the handlebars, none of which is compatible with the others. To some extent, this is understandable in that they are all from different manufacturers, but Topeak, who has a lot of well-conceived products, for some idiotic reason has three different rear rack track mount formats. Why oh why would you do this? In my case, the Topeak Super Tourist rear rack is the MTX format. Mounted to the bottom of the basket is the Fixer 6, a plastic shoe that slides into the rack track, and a yellow catch that catches the cross-bar at the front of the rack. It's securely mounted yet can come off in 5 seconds and go back on as quickly. The shoe raises the basket enough that it'll clear pannier hooks on the rack's side rails, so that if I'm buying a lot of beer I can mount 2 grocery panniers plus the rack-top basket (and then almost do wheelies all the way home). It's ever so practical, but I wonder why they sabotage their own idea with the three track mounting formats. A bicycle bell tinkled and I looked up and saw a Dutchman in a knit cap coming toward me. As he pedaled by, a fuzzy white head popped up from his bike basket. It was a terrier, chin up, ears perked forward, head tilted curiously to one side. Easy-riding Rover, I thought. The dog was probably enjoying the moment as much as I was. Its master and I were bicycling through the countryside about 25 miles southwest of Am sterdam, watching Holland's famous flower fields flash by. The terrain was flat, the air crisp and clear, the scenery a splash of dazzling yellow and green. Acres of bright daffodils stretched in every direction. I felt as though I had found bicycle nirvana. Perhaps I had. With 13 million bicycles, the Netherlands — or Holland, its regional name — has twice as many bikes as cars and nearly as many bicycles as people. 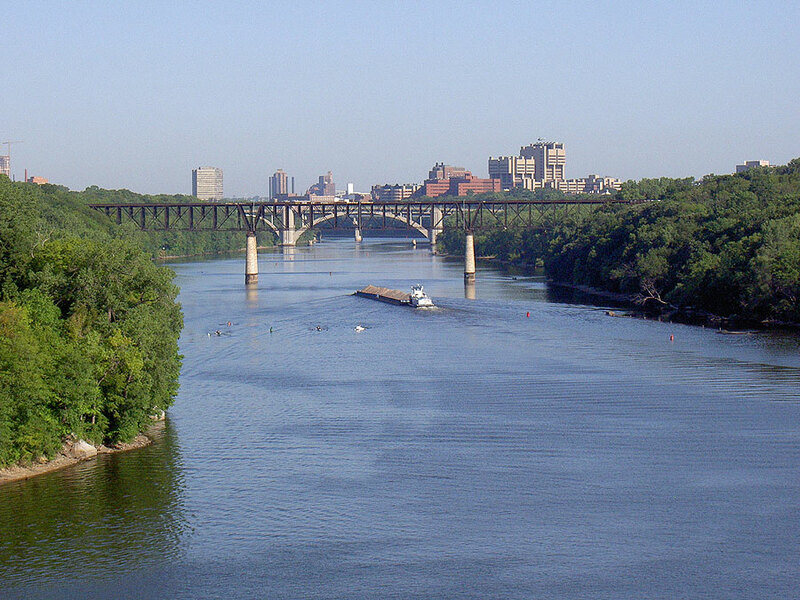 An 11,000-mile system of bike paths, many of which are separate from highways, crisscrosses a nation so small and flat that it's easy to use bicycles to transport people, groceries, even terriers. Accompanying the article was a photo of a bike with either a Basil or Basil-like pet basket on it. It's worth looking at their site; they make lovely wire and wicker baskets and the pet carriers look particularly useful as they have a wire cage thing to go over the top and apparently mount to the seat tube rather than directly to the rear rack so (I think) the pooch or kitty doesn't get shaken to pieces. Not that I'd take Sophie the cat anywhere, but it's still cool. I emailed Basil to see if they sold here in the U.S., but not yet, apparently. I also emailed Jim at Hiawatha Cyclery encouraging him to tie up all his working capital in a container-load of these things so that maybe I could buy one if I felt like it. Sadly, he may be learning after his Bleriot enthusiasm. Finally, also from the Dutch, a nifty bicycle maker. Take a look at De Fietsfabriek. There's lots of heavy utility bikes ("Perfect for families with two or three children") like the Dutch ride, cargo bikes, but also a whimsical High Bike. The best thing about this unit is the tongue-in-cheek suggestion that if you have to stop quickly in traffic, just put your foot on top of a car! You won't find that kind of advice on your Trek site! It was too long. Gotta get less wordy, I guess. I'm supposed to limit my emails to 20 lines. Of course, you don't find that out until you try and send it and there's plenty of room for what is in essence a full business letter. Pity, the email was from a signed-in, online me and associated with the account and everything. Fortunately, I copied it and mailed it to myself at home before trying to send it so it will form the basis of a nice letter to Wells Fargo. It is up to each financial institution - no problem with regard to insurance. It's those pesky banks.....you should be using your fantastic Credit Union!! She's right, I should. We have savings accounts and a car loan at the credit union but not our primary checking. This is basically because of inertia. I'm not even sure if Heartland has any drive-up lanes at the moment, but we're building a new home office opening next year (in Inver Grove Heights) and it will have drive-through lanes and I'm guessing they'll serve bicycles. I rode to work this morning and Karla's paycheck and deposit slip were still in my bag. I thought, what the heck, I'll ride through the Wells Fargo drive-through lanes and try depositing again. If they say no, I'll just loop around to the drive-through ATM and do it there. I circled through the parking lot to look at the hours. The office opens at 9:00AM, the drive-throughs open at 7:00. It was shortly before 8:30. Perfect. I rode into the drive-through lane, stuck the check and slip into the canister, hit the button, and Whoosh!, off she goes. The teller communicated with me twice. Whoosh! Then some more whooshing. And some more. The vacuum thing was malfunctioning. It finally popped up and I took out the canister and got my deposit slip (8:29AM) and the door closed immediately and more whooshing started. "Sir, we're having some difficulties with the tubes." "What should I do with this?" I yelled over the whooshing, holding up the canister. "Sir, I'm sorry but we can't hear when the vacuum's running." So I did a maneuver that would be tough in a car, pulled a U-turn, went over the curb and up to the front door, and left the canister there. This is actually more direct that my usual route, a left onto County E and then an immediate left onto Pine Tree, like I do in a car. As I rode out of the driveway a guy opened to the door and got the canister. "Thank you sir!" he called, and I waved back. So, what happened here? Did the awesome power of the blogosphere bring Wells Fargo weeping to its knees in a series of emergency weekend meetings to discuss drive-through policies? Did these morning tellers screw up and take my money against the rules, the scofflaws? Did Friday represent the small-minded application of obscure teller procedures or the perhaps the raw exercise of arbitrary power, a poor example of employee empowerment? Maybe they can take deposits from bicycles when the office is closed, and I've always deposited in the morning previously and so never had a problem? I'm not sure. My own paycheck is automatically deposited, so it'll be July 15 before we have another one to deposit (unless y'all want to send me checks, which I will deposit all over town as an experiment!). In the meantime, I am going to seek clarification on this. I am on the Supervisory Committee of Heartland Credit Union (where we have savings accounts and our car loan) so will be able to talk to our President and staff about this and can ask to see insurance policies and the like if need be. I am also going to call Wells Fargo and seek clarification about their policy, though the downside of this is that they do for some reason refuse to take deposits and reinforce this in the course of teller training and I won't even be able to make deposits in the morning. I'll keep you informed. Forget about 28-speed mountain bikes [What? Is that a Rohloff hub with 2 chainrings? ], cruisers with huge seats or $3,500 bicycles that shift gears automatically. Cyclists seeking an adrenaline boost on their commute are increasingly climbing onto a model straight out of the 19th century: a bike that has just one gear, can't coast and often lacks a feature prized by most cyclists and law-enforcement officials -- brakes. Taking a cue from velodrome racers and city bike messengers, a growing number of riders are buying so-called fixed-gear bikes. Unlike standard 18- or 21-speeds, fixed-gear models have pedals chained directly to the rear wheel so that whenever the wheel spins, so do the pedals. To stop, the rider has to slow down well in advance, or stand on the pedals with enough force to skid to a stop. Removing brakes and gears makes the bikes lighter and cheaper than feature-packed versions, and purists say they like these models -- also known as "fixies" -- for their simplicity and direct connection to the pavement. "Fixie" bikes are becoming more popular. While many riders used to build their own stripped-down models -- and some boutique makers have long sold them for track racing -- now major bike manufacturers are circling the market. Giant introduced its first fixed-gear model for the streets, the $500 Bowery, earlier this year. Last year, Trek introduced its T-1 track bike, a $1,100 model that comes without brakes, while Raleigh rolled out its $600 Rush Hour, its first fixed-gear model since 1980. And Specialized last year sold 5,000 of its fixed-gear Langsters, up from 600 when it introduced the line in 2001. Next year, Specialized plans to bring out a new version of its single-speed bike that transforms into a fixie by simply adding a cog. But for all of their hipster appeal, the bikes can be difficult to operate, if not outright dangerous. Because coasting isn't an option, stopping takes strength and concentration. A common mistake for novices who forget they're on a fixed-gear model is to stop pumping -- and go flying over the handlebars as the pedals keep spinning, a Specialized representative says. For men, the bikes present another challenge: Because riders can't stand up in the saddle to coast, long rides can result in reduced blood flow to the reproductive organs, which studies suggest may lead to impotence. Chris Dawson noticed fixed-gear bikes all over the street, and after checking a few pro-fixie Web sites, the 39-year-old lawyer in Sacramento, Calif., bought one earlier this year. "There's a perception that fixed-gear riders are these crazy guys," he says. "But here I am in my button-down shirt and tie." Now, the father of two rides it to work each day -- his is equipped with brakes, and he wears a helmet -- and says he loves showing off his new skills. That made it all the more embarrassing when he lost his balance recently in front of a line of cars at an intersection and toppled over. The danger doesn't stop when the bike does. Fixed-gear owners can injure themselves when the bike is elevated on a repair stand. In contrast with standard models, with chains that stop spinning if something is caught in them, the chains and pedals on fixies keep moving as long as the wheel is turning, even if something gets stuck in the works. Sites including fixedgeargallery.com, cyclelicio.us and Sheldonbrown.com contain tales of stuck digits, even pictures of severed fingers. Fans say they're unfazed. Riders say the bikes provide a killer workout because one can set the gear at a low level for added resistance. Macho types, meanwhile, revel at riding a bike they can stop only with their own brute strength. And experienced riders say plenty of rewards come with mastering the bikes -- with bragging rights conferred upon those who can execute moves like the "skip stop," in which a rider shifts his weight forward to unweight the rear wheel, locks his legs to hold the pedals in a horizontal position and skids to a stop. Another move is the "track stand," a technique pioneered on tracks and passed down to bike messengers, in which the rider balances in one spot by standing on the pedals. Tyler Cannon says he did his first track stand to make way for a biker approaching the other way on a narrow road. "It really made me feel like the man," says the 23-year-old from Lake Forest, Calif. His thrill was short-lived. "I crashed about 10 feet later when I smacked a pedal on a rock," he says. "Luckily, the other person didn't see." Newer devotees represent a milieu far from the bike-world fringes -- including doctors, teachers and Wall Street traders. This summer, hundreds of fanatics will descend on Traverse City, Mich., for the second annual Fixed Gear Symposium, organized by a 60-year-old real-estate broker. Bailey Fidler, a sales associate at Boston's Wheelworks bike store, says it used to be unusual to see anyone over age 40 shopping for a fixed-gear bike; now, he says, about half the bikes go to those in that age range. One popular pick: new models such as Cannondale's '07 Capo, which can be quickly converted to a single-speed bike that can coast and has brakes. While the U.S. bike business is booming overall -- it hit $6 billion last year, up more than 10% since 2003 -- these bikes remain a tiny niche. Of the three million specialty bikes sold this year, roughly 15,000 will be fixed-gear models, estimates bike-industry analyst Jay Townley of Wisconsin's Jay Townley & Associates LLC. While these basic bikes are typically cheaper than loaded-down bikes, they're still profitable. Margins on most fixed-gear bikes are about five percentage points higher than the 25% to 30% margins on a typical bike, says Mr. Townley. In regulatory terms, the bikes fall in a gray area. The U.S. Consumer Product Safety Commission says track bicycles are "designed and intended for use in a competition." They are exempt from federal requirements for standard bicycles, which call for bikes to have brakes at least in the rear. Fixed-gear sidewalk bikes -- the commission's term for one with a seat height of no more than 25 inches adjusted to its highest position, and no free wheel -- aren't required to have brakes if they bear a permanent label visible from 10 feet displaying the words "No Brakes." The same label must be displayed prominently on promotional display material and shipping cartons. The bikes have long been used by racers. They're illegal in many places. Laws in most states where fixed-gear riding is popular -- including New York, California, Maryland and Oregon -- require that bicycles be equipped with a brake that enables the operator to make the braked wheels skid on clean, dry pavement. Still, fixed-gear cyclists and lawyers in those states argue, often successfully, that the rider should count as the "brake" if he or she is able to achieve the same effect. To be on the safer side, bike shops generally advise customers to add hand brakes to models that come without them, and many riders do. Giant, for one, sells its fixed-gear model with brakes in the front and back. And in any case, makers say they don't recommend the bikes for novice riders, with many marketing their fixed-gear models as track bikes. "We think the people buying these bikes are savvy enough to know they're meant for one thing and one thing only. If a customer seems like they don't understand that, it's up to the shop to say, 'Don't go ride it in traffic.' That would be suicidal," says Andy Jacques-Maynes, road-bike product manager at Specialized. Ken Heike has a brake on his fixed-gear bike, though he tries to avoid using it. He was considering taking the brake off, he says, until a recent spill changed his mind. The 53-year-old hand surgeon in Oklahoma City, who started riding it to train for a triathlon, says he was "booking" through a parking lot recently when a car lurched backward. He says he froze, locked his legs -- and "went over the top" of the car. He broke his wrist and couldn't operate for two weeks, he says. "All my friends said, 'I told you it was dangerous.' I do wonder if it would have been a different situation on another bike," he says. As for the hand brake, he adds: "I think I'm going to keep it." There are no statistics on how many bike accidents involve fixed-gear cycles, and typically bike spills of all kinds go underreported. But overall, bike-accident fatalities are on the rise, especially in urban areas. In 2004, 725 cyclists were killed in traffic crashes, according to the latest data from the National Highway Traffic Safety Administration, up from 629 the previous year. Anecdotally, dealers say they see a higher proportion of fixed-gear bikes come back to the shop banged up. The bikes are providing extra work for lawyers. Mark Ginsberg, who has represented eight fixed-gear riders this year and serves as chairman of the bicycle-advisory committee of Portland, Ore., says he's seen the number of traffic citations soar recently, though he has yet to see the court hold up a single one. "A fixed-gear is a braked bike under the law," he says. "You just must be able to skid the wheel on dry, level, clean pavement." But David White-Lief, a personal-injury lawyer in Boston who specializes in bike accidents, says he's relieved that one of his current clients had brakes on his fixie -- even though that probably didn't help when a car took a left turn and knocked him down while he was riding on the side of the road. "It's just harder for a lawyer to explain to a jury or insurance company why someone didn't have brakes," Mr. White-Lief says. No brakes? No problem, says Daniel Gonzales. The 29-year-old bike messenger in New York, who's fighting his second ticket for riding brakeless, says he got the first in November when an officer stepped suddenly into the bike lane, raised his arms and ordered him to stop. "I thought I had demonstrated the fixed-gear stopped quite well," says Mr. Gonzales, who locked his wheel and skidded to a halt in front of the officer. "I didn't run into him." I went to the Bicycle Film Festival in Minneapolis Thursday night. It's Golf Night, so I played my round at Gem Lake (one actual sequence of scores: 9-2-9, the middle one barely missing being a hole in one. Consistency is key.) and drove home. It was about 6:30 and I gobbled down some dinner and thought, well, I can't very well drive to a Bike Film Festival now can I, and I can probably make the Riverview by 7:30, especially as this is a bike event and thus bound to be late-starting. I hopped on my Big Red Schwinn and zoomed off to the theatre. I usually move somewhere between a saunter and a cruise but now I actually pushed along, managing the 7.25 mile trip in just under half an hour, against a west wind at that. I was sweaty when I pulled up and there were bikes all over. Fortunately, they had Valet Parking for the bikes, and I checked in mine, one of the few with an actual useful kickstand. The first feature was the movie A Sunday in Hell (available here from World Cycling Productions, who don't have a bike rack in front of their store) about the 1976 Paris-Roubaix race. Eddy "The Cannibal" Merckx was in this race, though he didn't win. Watching the movie, it was striking how old it looked. I was in college at the time, riding the Motobecane Grand Record that still hangs in my garage, a ten-speed with a Campagnolo Nuovo Record derailleur, just like these guys were using. There were loving extended close-ups of a bike mechanic working on a bike, extended bits of dialogue in French and maybe Flemish or Walloon or something, and lots of race footage. I have noted on the photography bits of my website how badly some old films, and particulary old movie films, have aged (and I mean the actual film emulsion, not the movie-making technique, although that has aged as well) and this movie was a shining example. The vivid colors had faded and the overall effect was almost sepia-like. Combine that with the 70s fashions (big collars, lots of hair, crappy cars, hilarious motorcycle wear, a Bicentennial t-shirt, some of the ugliest wallpaper ever seen by mankind, and on the bikes, steel frames, toe clips, wool "retro" jerseys, no helmets) and the movie looks like some ancient historical artifact, perhaps something that happened when my father was a young man, not when I was. It's startling to see your youth in sepia-tone. The movie was pretty decent. A lot of bike movies tend to be really reverent and this was no different. Collosal battles, arch-enemies, epic rivalries, etc., it's as bad as NFL films, but it is a tough race, 166 miles, and includes several sections of wretched cobbled roads. There were some accidents and people's helmetless heads could get kind of chewed-up on the cobblestones. Towards the end, five guys break away. One flats out, but the final four make it into the stadium for the last lap and there's a sprint and a surprise winner. More jabbering in French, then interviews in the shower room with some very worthless-looking showers. It's a movie worth watching. The theatre then had to empty before the next show, so we all filed out. I watched the credits to see what film stock they shot this thing on (I'm guessing Eastman 5454 or 5247, I have photos from a couple of years earlier on that stuff that look just as bad) but they cut the credits before they were done. I'd bought the pass to all the movies so hung out in the lobby and then went back in. The second show was a bunch of shorter films. These varied in quality. The opening one is a clever animation done locally, about a guy who rides from Blaine to Milaca, a five hour ride, to see his girlfriend, who then dumps him. I'd seen this last summer at the Bike In at the Bell but there were some audio issues with it at that time, so it was good to see it again. It's spare animation with just a drum and voiceover but is very engaging. A short about some Brazilian stunt riders was cool, they were as pointlessly but dramatically skilled as figure skaters. A couple of the movies looked like my high school filmmaking efforts. A couple were really sweet, neither the overly-reverent Sunday in Hell style nor the full-to-the-brim of attitude messenger dude type. There were a couple of films about riding in San Francisco. I'd think this would be a terrifying enough prospect with gears and brakes, these guys do it on fixies or singlespeeds (though they only seemed to show them going downhill, not up). One guy has a singlespeed and brakes by putting his shoe on the back wheel. The fixie guys do it by leaning way forward to unweight the back wheel and holding the pedals still, which results in lots of skids. This probably isn't news to a lot of you. The tire makers must love these dudes. The final movie was a take-off on a 1979 movie called The Warriors. That's back when I used to watch a lot of movies (I even ran a movie commission in college) but I have no recollection of this flick at all. It must have resonance with some, though, as plenty of people seemed to get the references to it as an overnight team race goes from the Bronx to Coney Island. The write-up in the flier was a bit breathless, the actual event looked like good fun (people were in various costumes), but mostly I kept thinking as I watched this movie, Jesus Christ, get a freakin' tripod, will ya? Yeah yeah, I know, cinema vérité, documentary look, blah blah blah, congratulations on taking a film class, but the camerawork on this movie was pretty horrible and I closed my eyes for some of it it was so unwatchable. Movie over, Wow man, that was awesome, now we'll meet outside and go for a group ride (just like the Midnight Ridazz!!) in about 10 minutes said the organizer. It was 12:05. I'm gainfully employed, man, so went out, claimed my bike from the valet folks, and rode off alone into the night, headed home. Put the bike away, have a drink and a brownie, brush my teeth and it was into bed by 1:00. Overall, I liked this event more than the Bike In at the Bell last summer. That was fun, too, but started really late due in part to the four bands that played on interminably and the general oh man schedules are so fascist attitude that surrounds things like this. I liked the valet bike parking a lot, it was nice to be able to see the screen really well and hear properly, and there was no moon rising over the screen or dew settling on us. There are films tonight and Saturday too, and I'll be there for some of them. I'll be the tall sepia-toned codger.